A flock of waterfowl take flight. The U.S. Fish and Wildlife Service (FWS) announced the final early and proposed late season migratory bird hunting regulation frameworks for the 2015-2016 season. These guidelines are issued as part of a cooperative state and federal effort for the effective management of migratory birds. These announcements provide the framework by which each state establishes and manages their own migratory bird hunting seasons. Hunting plays a vital role in the effective management and conservation of migratory birds. FWS surveys in 2011 found that 2.6 million hunters, 19% of all hunters, pursued migratory birds and spent over $1.8 billion that year through trip-related and equipment expenditures. A large portion of this money went directly to migratory birds, wildlife, and habitat conservation through the Federal Aid in Wildlife Restoration Act, which levees an excise tax on hunting equipment to fund conservation efforts, and the Migratory Bird Hunting and Conservation Stamp Act, which requires migratory bird hunters to purchase a Duck Stamp that funds the Migratory Bird Conservation Fund. The Duck Stamp alone has raised over $800 million since its passage in 1934 and contributed to the protection of over 6 million acres of wetland. FWS establishes its hunting regulation frameworks on biological principles to ensure the successful management and conservation of migratory birds. 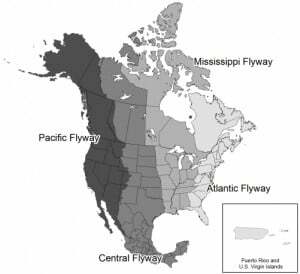 To manage the wide range of migratory birds and their habitats, FWS and its partners divided North America into four administrative regions (Atlantic, Mississippi, Central, and Pacific) referred to as Flyways. These Flyways were in part based on the migratory flight paths between nesting and wintering areas that the managed birds regularly follow year after year. Each Flyway has a council consisting of representatives from each state, provincial, and territorial agency within the Flyway. Councils establish technical committees of biologists to evaluate migratory bird populations and habitat data to inform their recommendations on migratory bird management to FWS. These recommendations are used by FWS biologists to form the hunting regulation frameworks. FWS analyzes harvest levels from previous years, the current population estimates and habitat conditions. The interaction of these factors, along with the Council recommendations, determines levels of harvest FWS will permit for the upcoming season. In general FWS has three levels of regulation they use: liberal; moderate; restrictive. Season start time, length, and daily bag limits vary between the levels. This year FWS estimated mallard abundance at 11.6 million, a 7% increase from 2014 and 51% higher than the long term average of 7.7 million. All four Flyway Councils recommended liberal regulations on mallard hunting based off the population data. Based off of this information, FWS has proposed liberal regulations for mallard. For the Atlantic and Mississippi Flyways this sets a season length of 60 days and daily bag limits to six individuals. If population estimates had been lower than anticipated or the Councils felt there was significant risk to the future health of the population, FWS could have implemented moderate regulations that would shorten the season length to 45 days. If necessary FWS could have implemented restrictive regulations that would shorten the season to 30 days and set the daily bag limit at three. The partnership of FWS, states, and the Flyway Councils has produced marked success in migratory bird conservation. 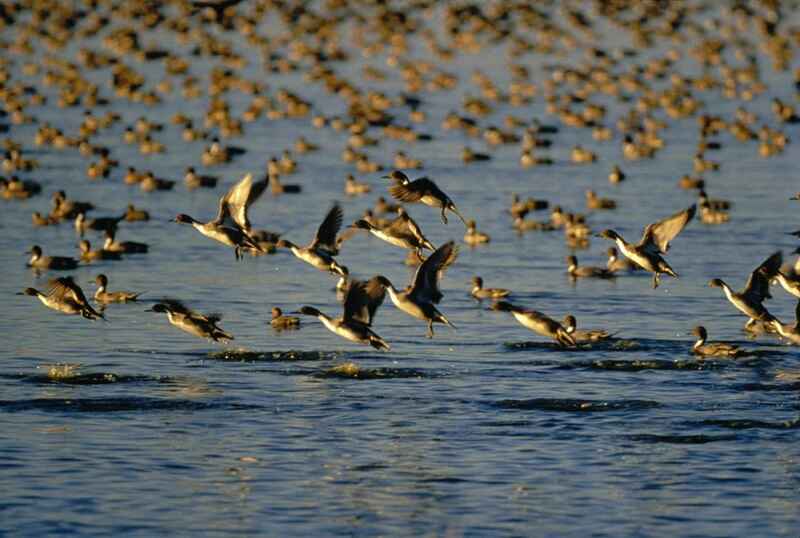 The centerpiece of this partnership is the North American Waterfowl Management Plan (NAWMP). Signed by the United States and Canada in 1986 and by Mexico in 1994, NAWMP was crafted in response to low migratory bird populations during the 1980’s. Through habitat protection, restoration, and enhancement in addition to educating the public on the benefits of waterfowl and wetlands, populations have rebounded. The 2015 Trends in Duck Breeding Populations report found 49.5 million breeding ducks, 43% higher than the 1955-2014 average. Zachary Sheldon is a policy intern at The Wildlife Society as part of the Government Affairs & Partnership program. Read more of Zachary's articles.